The movie shoot in 504 lasted all night including bright lights into the apts in 510 and 531 until after 2 a.m. on Thus/Fri and Fri/Sat. On Thursday night July 28 and Friday Night July 29 a film crew was working in, next to and behind 504 Main Street. Let me begin this message by stating I’ve lived here for 30 years and I’ve seen many film and photo shoots on this island. I never experienced anything as horrendous as this. On Thursday night, the crew set up enormous lights which were aimed into apartments at 510 Main Street and into apartments at the South wing of 531 Main Street. The lights were so intense that their beams penetrated tightly shut venetian blinds, bounced off the walls in apartments, and caused extreme discomfort to the residents all through the night. Calls to Public Safety were useless, as the people on phone duty had no idea this was going on, nor did they seem interested or able to help. The same thing occurred again last night, only this time the crew refused to adjust the lights, claiming they did not have enough staff to do so and didn’t want to interrupt the scene they were shooting. The crew members said they would be working through the night until 7AM. Again, the lights penetrated my apartment such that I couldn’t watch tv or fall asleep. 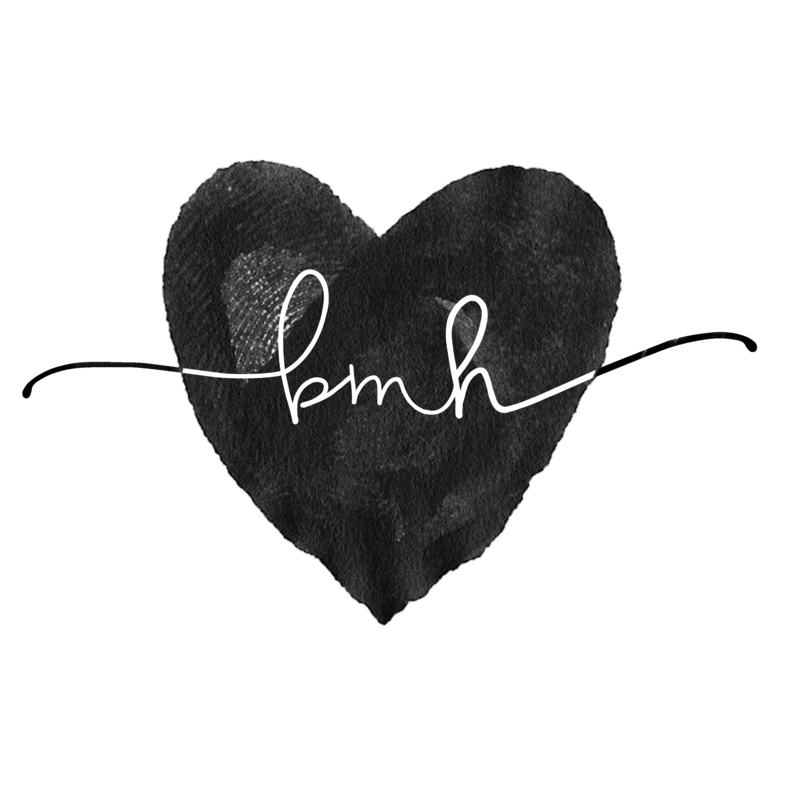 The only thing one of their crew members offered was to come to my home and install black cloths across my windows. That’s absurd…in other words I should have strangers traipsing through my apartment with dirty shoes, move my furniture away from the windows, put tape or tacks into the walls, possibly knock over lamps or tables or break fine antiques and not be there in the morning to restore my apartment from a cave??? Wrong answer!!! The evening doorman in my building, Rivercross, claimed he had numerous complaints about this situation from the residents in our building. In view of this, it is imperative that the RIOC officers and directors immediately revisit the permitting process and revise the language of the permits to ensure that residents are not caused any discomfort or harm in their homes during such events, specifically including clauses about lights, water and noise. (Anyone remember the damage caused to Eastwood during the filming of “Dark Shadows”)? 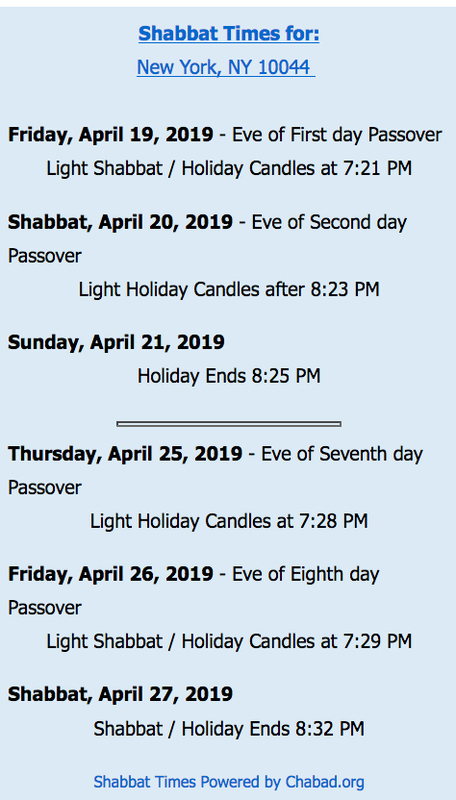 Indeed, if any Roosevelt Island resident or visitor were to play loud music, set off firecrackers, or shine lights into apartments we would be arrested, yet RIOC allowed this film company to cause a similar disturbance! One other thing: There was not one advisory or notice about this film shoot from RIOC. The only protection offered by Public Safety was to station our officers at the filming location to protect them and their property, but not to protect the residents. It is shameful, despicable and insulting that the officers of RIOC have no regard or consideration for the residents of this community who are voting taxpayers who pay their salaries not only from NY State taxes, but also from our monthly apartment maintenance or rent. In NY City, in addition to detailed permits, there is also an accompanying “code of conduct” requirement for filming production on location! One thing not mentioned by Ms. Schwartz is the destruction to Blackwell Park. The tractor trailer trucks break up the paving and cause damage to the walkways. these trucks are too heavy to be put on a not roadway surface. Also the entire west side of the park was used as a parking lot for the weekend. This precludes the use of the sitting area by residents. On Tuesday, August 2, 2011, ALL Roosevelt Islanders are welcome to join the Roosevelt Island Operating Corporation in the highly anticipated GRAND OPENING of Southpoint Park. The ribbon cutting ceremony will commence at 9:00 AM. There will be Red Bus service available to the park. We hope you join us for this memorable occasion and become Southpoint Park’s first guests. 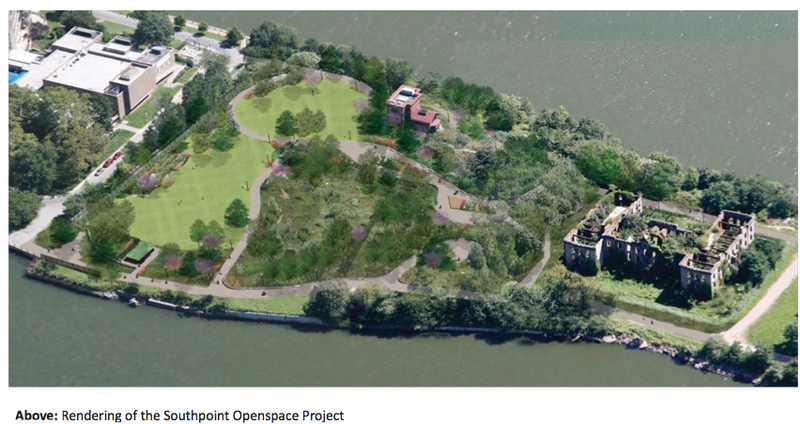 The entrance to this new 7 acre East River waterfront park is a few feet south of the Goldwater Hospital campus and extends to the Renwick Ruins Smallpox Hospital. Soon the Ghost Hunters may return to get up close and personal with the Ruins again in search of Roosevelt Island spirits. Wild Gardens Green Rooms had been the previous name for this project but it is now being called just Southpoint Park. Here's what Southpoint Park looked like last week from outside the construction fencing. Looking forward to having this portion of Southpoint Park open again. The rest of the area of Southpoint Park south of the Renwick Ruins Smallpox Hospital is where the 3 acre Louis Kahn Memorial Boondoggle is being constructed - oops, it's official name is the FDR Four Freedoms Park Memorial. This area is still closed and will not open for several more years. 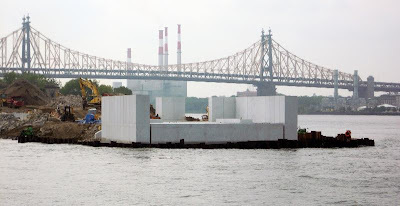 Here's the latest picture of the recently constructed Louis Kahn Death Box (or sculpture room) at the FDR Four Freedoms Memorial on Roosevelt Island's most southern tip. 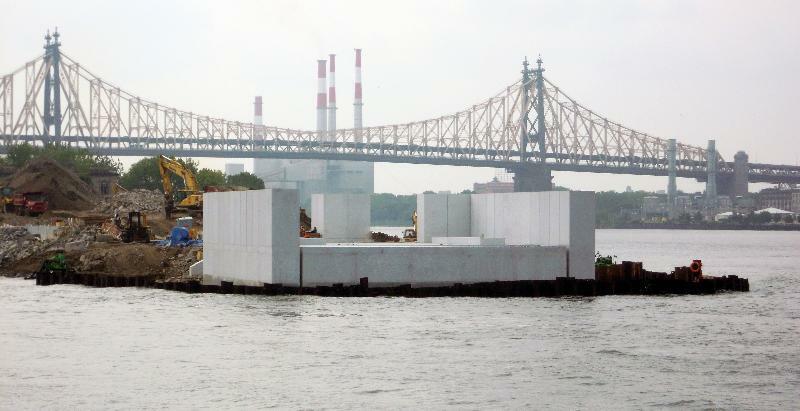 Such a pity that this monstrosity has ruined what had been the beautiful southern tip of Roosevelt Island. will be located in a part of the new Southpoint Park. Here's a wonderful profile of Roosevelt Island resident Nancy Brown, one of the FDR Hope Memorial organizers, explaining why it is so important to have such a representation of President Roosevelt, particularly on the New York City Island named after him. 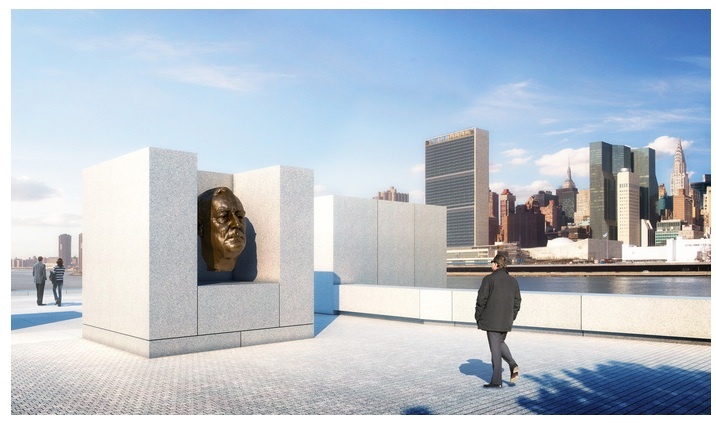 For purposes of clarity, the FDR Hope Memorial depicting President Roosevelt sitting in a wheelchair and the Louis Kahn designed so-called FDR Memorial are two different and separate projects. More information on the FDR Hope Memorial from previous posts. If you wish to help or contribute to developing the FDR Hope Memorial, please visit their web site to learn more and for contact information. UPDATE 8/2 - Here's what happened at the Grand Opening Celebration of the new Southpoint Park earlier today. 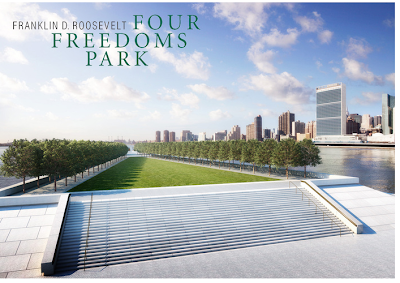 UPDATE 8/12 - Here's some more images from the Kahn/FDR Memorial Boondoggle. Unfortunately, it looks more like a cemetery to me than a waterfront park. What a pity that TPL's Master Plan for all of Southpoint Park, (including the area of what is now the location for the Kahn/FDR Boondoggle) was not accomplished. 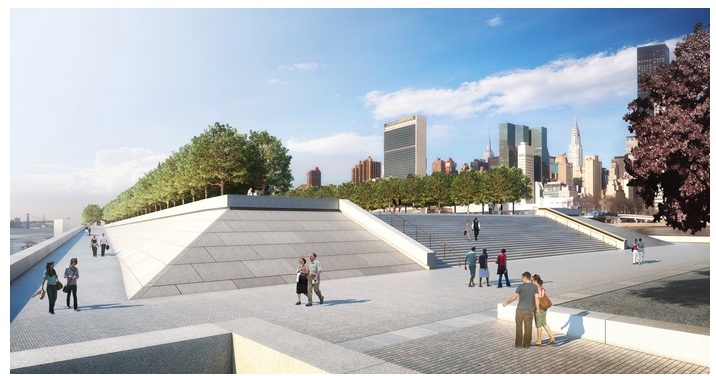 A positive review of the Kahn FDR Memorial was published by Bloomberg today. PLEASE TAKE NOTICE that a meeting of the Operations Advisory Committee of the RIOC Board of Directors will be held on Friday, July 29, 2011 at 5 PM at the RIOC administrative office, 591 Main Street, Roosevelt Island, New York. and the full RIOC Board of Directors will be meeting on August 3. UPDATE 8/2 - Audio Web Casts of the Operations Committee Meeing and the Governance Committee meeting are now available. A couple of Television programs have been filming on Roosevelt Island this week. According to RIOC, the new CBS program Unforgettable starring Poppy Montgomery and Dylan Walsh is shooting today and tomorrow at 504 Main Street. 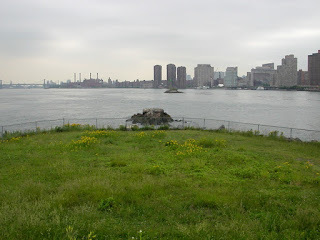 The show's pilot had been filmed on Roosevelt Island last April when it was named The Rememberer. Also, The USA network program Royal Pains was filming at Goldwater Hospital yesterday. Don't know if any of the series stars were present. Please be advised the South Tram Cabin is running at a reduced capacity until further notice. The South Cabin is temporary out of service. The north Cabin is unaffected . The South Tram Cabin has been experiencing difficulty recently with several service advisories issues regarding disruption in service. 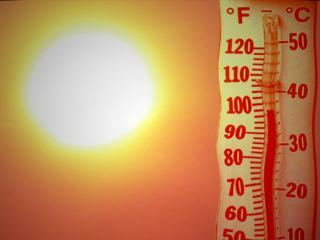 During the recent heat wave, the mechanical rooms became extremely hot. We ran the Tram at reduced capacity in order not to over work the motors. The disruption of service on the South Tram was due to a part failure. The part was immediately replaced and tested, and the Tram was returned to service. Earlier today, Roosevelt Island's city (NYC Council Member Jessica Lappin), state (Assembly Member Micah Kellner and Senator Jose Serrano) and federal elected officials (representative from Congresswoman Carolyn Maloney's office) joined with Roosevelt Island Operating Corp (RIOC) President Leslie Torres and community leaders at the Manhattan Tram Station Plaza to urge that Roosevelt Island be selected as the site for New York City's state-of-the-art- Applied Sciences and Engineering School proposed by Mayor Bloomberg and the subject of this Applied Sciences NYC Request For Proposals. During the press conference held at a noisy Manhattan Tramway Plaza next to the Queensboro Bridge, Ms Lappin presented some of the benefits for a University selecting Roosevelt Island as the site for it's facility - easy public transportation access with the F Train and Tramway, wonderful parks, revitalized Main Street Retail, including a Starbucks for coffee drinking students, an excellent public school with a gifted/talented program and noted that Governors Island and the Brooklyn Navy Yard just can't compete with Roosevelt Island. Sorry about the background noise from the traffic. More information on the possibility of a world class engineering school being located on Roosevelt Island available from previous posts, including proposals by Stanford University and Cornell University. Council Member Jessica Lappin, Congresswoman Carolyn B. Maloney, Assembly Member Micah Kellner, and State Senator Jose M. Serrano are officially supporting the city’s efforts to bring a world class engineering school to New York City - and want it to be located on Roosevelt Island. They have formed a coalition in support of an engineering and applied sciences campus where Goldwater Hospital currently sits and were joined at a press conference today by Roosevelt Island Operating Corp President Leslie Torres, Roosevelt Island Resident Association President Matthew Katz, and other community leaders. Last week, when Mayor Bloomberg issued a Request for Proposals and invited universities to submit bids, he offered the option of a privately owned site or one of three city-owned parcels: Goldwater Hospital on the southern tip of Roosevelt Island, part of Governor’s Island, or a portion of the Brooklyn Navy Yard. He has also pledged up to $100 million in infrastructure upgrades for the project. “The Roosevelt Island community has been extremely receptive to the idea of bringing a competitive engineering school to the island,” said Senator José M. Serrano. “Its access to mass transit, proximity to midtown Manhattan, and welcoming residents will ensure a smooth adjustment for any school coming into the area. Roosevelt Island is truly looking forward to helping to strengthen the fields of science and health in New York City." "We are excited at the prospect of a world class research university on Roosevelt Island," said Leslie Torres, President of the Roosevelt Island Operating Corporation. "The Island's location and reputation for innovation make it an ideal spot for any institution." A representative of Community Board 8, members of the RIOC Board and Roosevelt Island Disabilities Association President Jim Bates also lent their support for bringing an engineering school to Roosevelt Island. Before issuing this RFP, the city received 18 less formal “expressions of interest” from 27 schools around the globe. The NYC Economic Development Corporation estimates the project will generate $6 billion in economic activity, hundreds of new companies, and more than 22,000 permanent jobs for New Yorkers over the next 35 years. 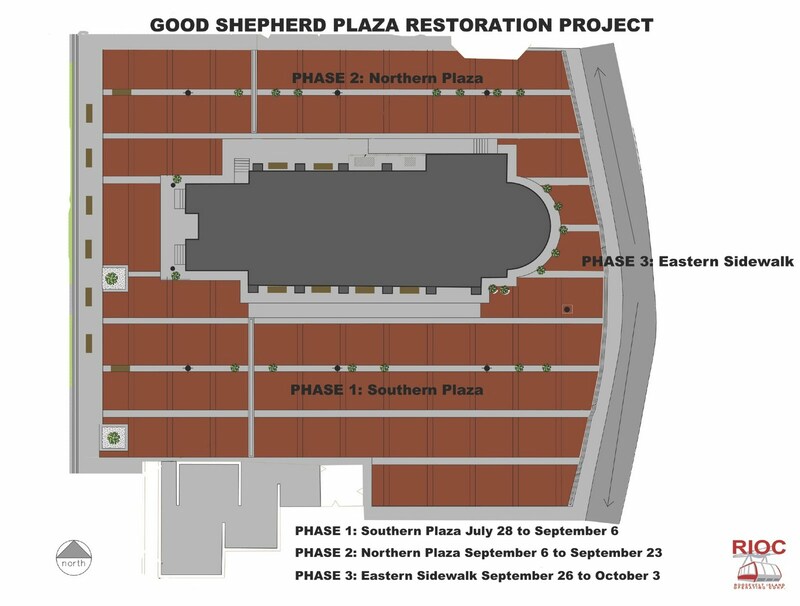 Proposals are due by October 28th and the city is expected to select a bidder before the end of the year. Removal and disposal of existing concrete and brick pavers, light poles and trench drains. Excavation and disposal for installation of new pavement sub-base. With the resignation of #JayWalder, @NYGovCuomo should ask @RichardBrodsky to serve as the next chair of the #MTA. He would be amazing! Here's the You Tube Video of Ms. Lengle's interview of Richard Brodsky. The U.S. Postal Service, which projects it will reach its $15 billion borrowing cap by the end of September, wants to make it easier to close some of its 31,871 post offices for economic reasons. As more customers choose to conduct their postal business online, on their smart phones and at their favorite shopping destinations, the need for the U.S. Postal Service to maintain its nearly 32,000 retail offices — the largest retail network in the country — diminishes. To that end, the U.S. Postal Service announced today that it will be taking the next step in right-sizing its expansive retail network by conducting studies of approximately 3,700 retail offices to determine customer needs. As part of this effort, the Postal Service also introduced a retail-replacement option for affected communities around the nation. The Roosevelt Island Post Office is listed as one of those being considered for closing. -- 385 post offices with less than $600,000 in annual revenue, and 5 or more postal service locations, such as stamp kiosks, within two miles. -- 188 post offices with less than $1 million in annual revenue, and 5 or more postal service locations within 0.5 mile. -- 19 offices currently suspended. If the Roosevelt Island Post Office closes, I believe the closest Post Offices will be at Broadway/ 21st Street in Astoria or Third Avenue and 55th Street in Manhattan. ... Most of the offices that face review are in rural areas and have low volumes of business. As many as 3,000 post offices have only two hours of business a day even though they are open longer, said postal vice president Dean Granholm. Coming under review doesn't necessarily mean an office will close. The post office announced in January it was reviewing 1,400 offices for closing. So far 280 have been closed and 200 have finished the review process and will remain open. This is a very discouraging rumor. 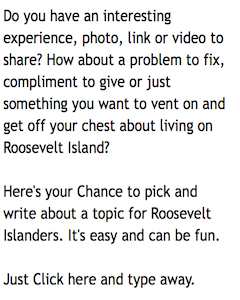 Obviously, Roosevelt Islanders need their own Post Office -- going to Queens or Manhattan is just not feasible. I will work with the community and other elected officials to ensure the Post Office remains open. Roosevelt Island is a unique place in our great city that has many magical qualities -- but since Islanders can’t walk on water, it is imperative that the USPS maintain services at Roosevelt Island Station. 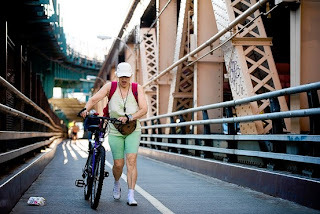 It’s an important part of the Roosevelt Island community; without it, Islanders would not have access to the full array of postal services without traveling long distances across the swift-loving body of water that is the East River. Closure of Roosevelt Island Station is particularly ill-conceived given the high numbers of persons with disabilities and of seniors living on the Island, who depend upon the Island postal facility day in and day out. That said, it is critical that Roosevelt Island residents make sure their voices are heard by the United States Postal Service on this important question. In the coming months, I will be joining with other government and civic leaders to alert Islanders about the potential threat to their post office, and to encourage them to respond to surveys by the USPS and others measuring the degree of support the local community is providing to Roosevelt Island Station. Congresswoman Maloney helped lead the successful efforts in 2009 to prevent the closure of two other post offices in New York’s 14th Congressional District that had been placed on a list of USPS facilities to be considered for closure: Pitt Station on the Lower East Side, and Cherokee Station in Yorkville. At that time, the USPS had suggested that Upper East Siders using Cherokee Station might substitute Roosevelt Island Station for their everyday postal needs – a suggestion that made so little sense to anyone that it was deemed laughable. Asking Roosevelt Islanders to substitute post offices in Manhattan or Queens for Roosevelt Island Station is an equally ill-conceived scheme, and Congresswoman Maloney intends to join with other elected officials in fighting any proposed closure of Roosevelt Island Station to the hilt. If the Roosevelt Island Post Office is, indeed, being considered for closure, it is a truly disheartening prospect. For many Roosevelt Island residents, traveling to Astoria or Manhattan to go to the Post Office is simply not an option. I look forward to working with my colleagues to make sure the Roosevelt Island Post Office remains open for business, and that the residents of the Island are not deeply inconvenienced by its closure. Roosevelt Island is just that – an island. As such, it needs its own Post Office on Main Street. I will work with Congresswoman Maloney to keep this critical branch open. UPDATE 8/17 - Here is an online petition to save the Roosevelt Island Post Office. There are paper petitions available at some Roosevelt Island building lobbies. Ask your concierge. ... Cornell will propose developing the land on Roosevelt Island, which lies between Manhattan and Queens on the East River — across the water from the University’s medical school, Weill Cornell Medical College, Fuchs said. ... Fuchs said that Cornell will differentiate its proposal with an unusual academic organizational structure centered around research hubs, instead of traditional departments like those found on the Ithaca campus. The hubs will focus on areas such as global media, technology for a healthier life, trustworthy computing and built environment, he said. ... Cornell would build its proposed campus on Roosevelt Island rather than the other sites the city offered — Governors Island and the Brooklyn Navy Yard — because Roosevelt Island is the only one easily accessible by subway, Fuchs said. The island is just across the East River from Weill Cornell Medical College — which recently broke ground on a state-of-the-art, $1 billion medical research complex on East 69th Street — and is already home to many employees who work there. Cornell University is very familiar with Roosevelt Island having faculty and graduate student housing in Southtown's Riverwalk development. Cornell occupies the entire 465 Main Street Building and 88 of the 230 Riverwalk Place condo units at 455 Main Street. as well as more information on Stanford University's proposal for a Roosevelt Island Applied Sciences and Engineering School campus. Mr. Towns is also the Roosevelt Island Operating Corp (RIOC) Chairperson. Here's my favorite movie shootout scene from the end of Quentin Tarantino's Reservoir Dogs. from Roosevelt Island's haunted past as reported in previous posts? The Wall Street Journal investigated and found out that the sound came not from a ghost or spirit but from Opera Singer Sue Hassel's daily vocal practice as she walked to work each morning over Roosevelt Island on the Queensboro Bridge. ..."The beauty of the bridge is there is no expectation of quietude because of the traffic noise, and I am out in the open air," she said. "Every 20 minutes on my way to work, I would vocalize very carefully. And it just slowly started coming back." Her voice—usually singing in the baroque coloratur a style—carries at least as far as Roosevelt Island, where building concierge Mary Middleton said tenants at first wondered if they were hearing a ghost from a historic island home. "At first, the sound was kind of scary," Ms. Middleton said. "Everyone thought the sound was coming from Blackwell House before learning it was actually the bridge." She said she and the building's tenants soon grew accustomed to the morning serenade. Tenant Chris Vail first heard Ms. Hassel while eating breakfast in his dining room. "It's interesting how quickly you develop a relationship with the sound," he said. "I look forward to it and it becomes part of your daily routine." Here's the whole Wall Street Journal article and listen to the Ms. Hassel's singing on the Queensboro Bridge. More on Roosevelt Island's ghosts and spirits here.